While climate-smart agriculture (CSA) practices have proven effective in increasing food security and the resilience of farming systems to climate change, their adoption and uptake in many parts of Africa is still low and usually pegged to the lifecycle of projects promoting them. Head of EMU, Nantai Shakwanada speaking at the opening session. Therefore, two recently concluded CSA scaling projects have generated evidence to inform policies on how and where CSA practices can work to support its dissemination and adoption. The projects have identified several lessons in their efforts to widely promote CSA innovations among smallholders to increase food production, reduce greenhouse gas (GHG) emissions, and build the resilience of farming systems to climate change. The projects, “Increasing food security and farming system resilience in East Africa through wide-scale adoption of climate smart agriculture practices,” and the “Policy Action for Climate Change adaptation (PACCA),” shared these insights at two end-of-project workshops—one held in Dar as Salaam, Tanzania, on 27 October and the other in Kampala, Uganda, on 30 October. The two four-year projects were led by the International Center for Tropical Agriculture (CIAT) and IITA, respectively. The projects highlighted the importance of robust and resilient, gender-responsive policies at national and local levels and gender inclusivity in climate-smart agricultural interventions. Assessment of whole-farm trade-offs and synergies in the selection of CSA practices and providing farmers with adequate information on advantages and disadvantages of the practices, involving farmers in prioritizing the practices and supporting farmer-to-farmer and community wide social learning were also seen as key. It was also necessary to understand farmers’ constraints in adopting CSA practices, the drivers of adoption of these practices across different scales, and the use of participatory design interventions with farmers to create ownership and sustainability. These include participatory and real-time monitoring of the interventions. Another key area was the need to invest in climate-smart land and soil management practices. The IITA-led PACCA project funded by the CGIAR Research Program on Climate Change, Agriculture and Food Security (CCAFS) aimed to use science-based evidence in influencing the formulation and implementation of climate-smart and gender-sensitive policies necessary for climate resilient food systems in East Africa. “We reviewed agriculture policies in the two countries at both national and local levels and found that they did not sufficiently address climate change issues. The policies also did not adequately incorporate gender,” said Edidah Ampaire, PACCA project coordinator. “We used future scenarios to ensure the policies were robust and comprehensive in tackling climate change in relation to food security. We also promoted the formation of learning alliances at national and district levels to support policy formulation and promotion of CSA practices. The learning alliance created “a space” for knowledge sharing, training on climate tools, and distribution of latest CSA research,” she said. The objective of the CIAT-led initiative funded by the International Fund for Agriculture Development (IFAD) was to support the scaling of our CSA practices through using participatory approaches to select appropriate CSA practices and identify and address the constraints identified by farmers in adoption of the practices. 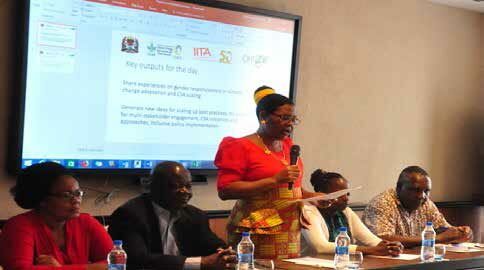 Caroline Mwongera from CIAT and coordinator of the project gave an overview of the activities and experiences. “Our main challenge in selection of appropriate CSA practices was that they vary from context to context. This led to development of a rapid appraisal tool to identify perceived benefits of and barriers to adoption. We also used crop modeling to identify the most promising practices. “Working with partners we set up demonstration plots for the most promising practices and conducted participatory monitoring and evaluation. The projects also worked through the learning alliance (LA), for sharing knowledge, tools, approaches, and policies for wide-scale adoption of CSA technologies,” she said. Some of the learning alliances had successfully attracted climate change funding from the district budgets. “We convinced the councilors to pass a budget of TZS 10 million for climate change issues and for the Chairperson to participate in learning alliance meetings,” said Moses Eliezer, the Lushoto learning alliance facilitator. The workshops brought together the projects’ stakeholders, who included donors, parliamentarians, government technocrats, scientists, NGOs, and farmer representatives, among others. The aim of the events was to facilitate sharing the evidence generated from the two CSA scaling projects and inform future climate adaptation, and CSA planning and implementation through testimonies, presentations, panel and plenary discussions, as well as short documentaries. The projects were co-implemented in Uganda by the Climate Change Department (CCD) under the Ministry of Water and Environment (MWE) and in Tanzania by EMU under the Ministry of Agriculture. They both started in 2014 and ended in 2017.